Not many high school students can prepare a home-cooked meal from scratch, but it’s a regular occurrence at Springfield Urban League’s 21st CCLC program at Springfield High School. Thanks to our partnership with St. John’s Hospital, students are getting hands-on experience with cooking skills and an introduction to the possibilities of culinary education. 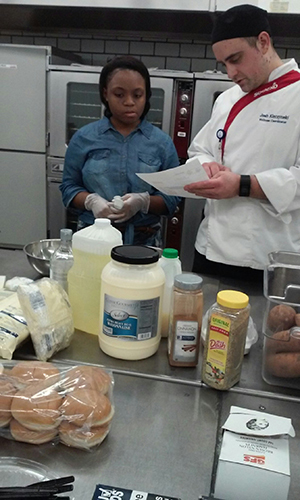 A student examines a recipe with Chef Josh. It all started in a cooking class I attended over the summer. I learned a lot and had a great time in the class. I thought, “This would be a great opportunity for the students in my afterschool program.” Not knowing what to expect, I asked the instructor if he would be interested in working with our afterschool program. Chef Josh Kleczynski was enthusiastic about working with us, and he was also the Sodexo Wellness Coordinator for St. John's Hospital. The resulting partnership with St. John’s Hospital has been outstanding. I’ve been surprised and pleased by the support we get from their very dedicated staff. They definitely go above and beyond. The course, designed and taught by St. John’s Chef Josh, brings value beyond culinary skills to our students. The activities teach life skills applicable at home and in any job situation. Other course goals include helping to develop leadership, promote self-efficacy, provide a sense of accomplishment, and encourage service to others. Students are really enjoying the program. Attendance is high on cooking-class days, and throughout the week there are questions about the upcoming menu. Will it be spaghetti and meatballs, pork chops and turnip greens, chicken tacos and salsa? After a long day at school, students are usually hungry during afterschool hours, and some may not have food at home. 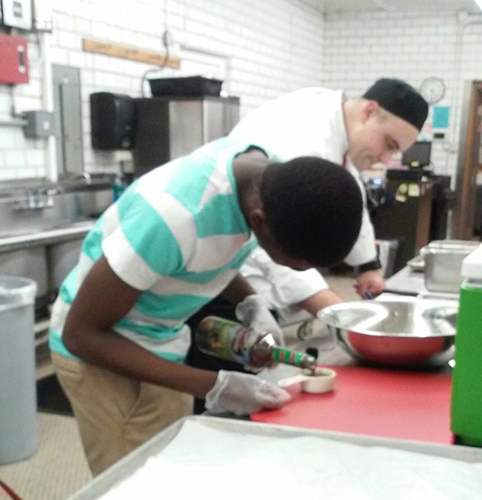 A Springfield High student measures ingredients for a recipe. A good example of an activity showcasing our students’ different achievements was our Black History Month program and family dinner. Afterschool students not only presented a program on the Little Rock Nine, they also showed the importance of family dinner time by cooking a meal inspired by their cultural heritage for 40 to 50 family members and participants! Similarly, the culinary class members are learning to give back to the community. They have prepared meals for younger kids in the Compass program, a free afterschool program for low-income and homeless children. While some of our students prepared the meal, others gave cooking demonstrations, yet another lesson taught by Chef Josh. Students’ enthusiasm has created a boost to family engagement with our 21st CCLC program, as well. When I called one student’s home, his elderly grandmother answered the phone. She never quite understood that I was calling to invite her to the program, but she was excited to tell me all about the cooking class her grandson was taking at school. I knew then that the program had a large impact on our families! Parents attending the Black History Month event expressed appreciation for all of the activities provided by our site. They specifically liked seeing their kids becoming more independent and learning cooking skills. And we include a program feature that’s especially popular with parents: In addition to preparing and eating a healthy meal in class, students are given a take-home bag of ingredients to recreate the recipes they’ve learned for their families. Our partners at St. John’s Hospital not only help teach families that cooking from scratch has numerous health and financial benefits, they also help to feed those families. Another positive result of the program can be seen in the relationships being built between school staff and the afterschool program. The culinary class is especially appreciated by the school’s custodians, who are always on campus during afterschool hours. The students prepare dinner for them and share what they’ve learned in class that evening. Sometimes teachers staying late at school will come and eat with the group, too. When they do, they see school-day lessons and academic skills being put into practice. For example, measuring requires math knowledge, mixing ingredients calls on the methods of science, and reading recipes helps them practice language and literature skills. It’s also evident that, while the students may be reinforcing their academic skills, they are having fun! The cooking program is an important part of our 21st CCLC. It acquaints students with career opportunities they probably would not know about if they were not in the afterschool program. At Springfield High we have a great group of youth. They are willing to learn and are eager to succeed. The kids are constantly being exposed to positive elements, which is very important. With partnerships and programs like we provide, we will build a better future. This website was developed by SEDL and was funded by a contract with the Illinois State Board of Education (ISBE). The content does not necessarily reflect the views of the ISBE or any other source. Copyright © 2014 SEDL. All rights reserved.